.net magazine is offering all their subscribers one year of free uptime monitoring from Pingdom, worth $119.40. The offer is included in issue 166 (summer 2007) which should already have landed in your mailbox if you are a subscriber. Look at the insert included with the magazine to get information on how to claim your free Pingdom account. .net magazine, called Practical Web Design in the US, is a leading magazine about web development and design. It is known for great hands-on tutorials, interviews with famous industry personalities, software reviews and design showcases. 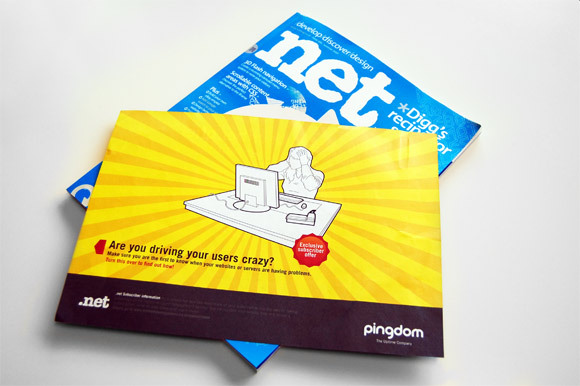 We are of course very happy to see .net magazine choose Pingdom for their special subscriber offer this summer, a suitable match since it is something every webmaster can make good use of. What webmaster does not want to keep a close eye on the uptime of his/her website? Pingdom has previously been featured in the magazine with an article called “The right marketing for your web service” in issue 164.